Using a sound pressure level meter, I found that at a distance of about 2 metres, my prolonged unmuffled yell recorded a consistent 100 dB(A). Through one muffler the yell was subdued to 76 dB(A), another recorded 80 dB(A), another was at 82 dB(A) and one didn’t drop the level at all – ie it stayed at 100 dB(A). The fascinating thing is that the order and relative magnitude of these figures closely matched the results I achieved at full load on the test car! Today, I found myself doing the same sort of ‘test’. I’ve recently got hold of two Ferrari mufflers and two Jaguar mufflers. The Ferrari mufflers are off a 575M; the reason I bought them was that they each have an adjustable, external butterfly valve in one of the two outlets. I was after these valves to use in other applications. 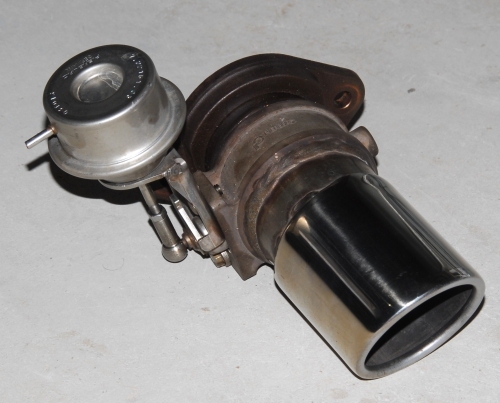 The Jaguar mufflers (resonators, really) are compact, straight-through designs. They’re off a supercharged XJR100. The ‘yell’ test indicated that the Ferrari mufflers were nothing special. With the variable valve open, they barely subdued the yell, and even with it shut, the yell was still pretty loud. But the little Jaguar resonators were something else. Simply, they’re stunningly effective. They seemed so good that I reached for the noise meter. This time (different noise meter and about 13 years later! ), my naked yell recorded 92 dB(A). Through the Jaguar muffler this dropped to 73 dB(A). That attenuation is 19 dB, versus a best in the previous ‘test’ of 24dB. But the previous results were with large body, 3 inch mufflers! 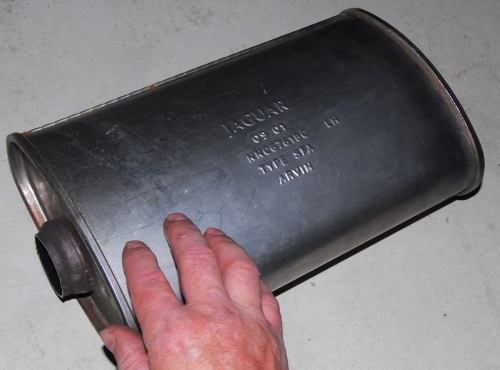 The Jaguar mufflers have vastly less volume (and it must be said, at 1.75 inches, smaller diameter tube as well). But an even better result was achieved with my wife, Georgina, as the yeller. As you might expect, her yell [92 dB(A)] was higher pitched. And, as theory suggests should be the case, the straight-through muffler worked even better with the higher frequencies. The reduction in noise level was an amazing 27dB! A reduction of this magnitude is a decrease in sound power of 99.8 per cent. Listening to Georgina yell through the muffler, it was like she was literally at the other end of the street, perhaps 200 metres away. It was quite weird – you could see the effort she was putting into the yell and yet almost nothing was coming out the other end. I’ve looked closely at the Jaguar mufflers (made by Arvin – type SFA… that’s easier to remember!) but I can’t see anything that makes them special. And perhaps it’s just the smaller tube diameter that gives the great results – but I don’t think so. Anyway, no doubt I’ll try them on a car one day and then I’ll find out for sure. Don’t dismiss the yell test, especially if you’re trying to get rid of higher frequencies. In fact, try it for yourself and be similarly fascinated by the outcomes! Welcome back Julian and happy new year, we missed you! If any one is interested. Yes you can do a static test for mufflers. You are measuring insertion loss. We sometimes do them at work for large (500 nominal bore) industrial exhaust silencers. For consistency, use a large speaker and play white noise (or whatever you like). Also you should use a straight piece of pipe for the naked yell. When we do our tests it gets more complicated but essentially it’s still a static test, and cheaper than running a large diesel on load. It’s good to have a sound level meter that measures 1/3 octave results. Especially if you are interested in the spectrum, rather than overall. They can be hired. What is also very important is a simulation of the temperatures; they alter the damping capabilities of a muffler in extreme ways.